Obama's Iran deal is a direct manifestation of the President's fundamentally misguided worldview, one that wishes away danger and then believes in the wishes. Even more concerning is that the Iran deal may directly conflict with U.S. obligations as a signatory of the Non-Proliferation Treaty. The Iran deal may be unconstitutional, violate international law and feature commitments that President Obama could not otherwise lawfully make. By seeking approval of the deal under the UN Security Council, Obama has bound the U.S. under international law without Senate consent. 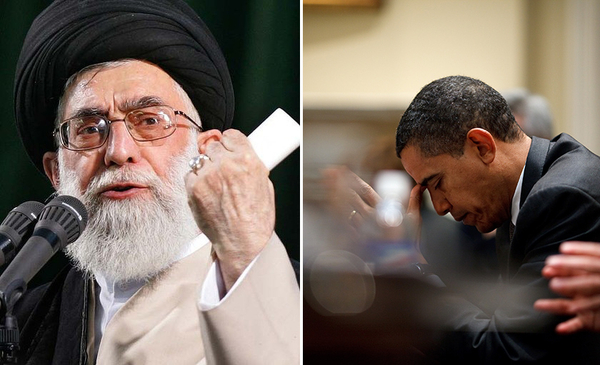 The gravest consequence of Obama's Iran deal is that the world bestowed ideological legitimacy on the Islamic Republic's radical theocracy, and in so doing has consigned the people of Iran to near permanent rule under the iron fist of Shi'a Islamism. A total reversal of the Iranian regime's behavior should have been, and still can be, a precondition for the removal of any sanctions related to Iran's nuclear program. An end to Iran's financial and materiel support for terrorist forces such as Hezbollah and Hamas must be demanded, along with the return of the four American hostages Iran is holding. There is still time for a better deal that can be had. As President Obama and Secretary Kerry dominated the airwaves with rounds of media interviews to defend the Iran deal last week, German Vice Chancellor and Economic Minister Sigmar Gabriel flew straight to Tehran for the first of what are certain to be countless meetings by P5+1 leaders to capitalize on new business opportunities in Iran. In Europe, it seems, there is no debate to be had over the Iran deal; rather, it is a fait accompli. But in the United States, the domestic debate is heating up, fueled by a Presidential primary campaign and increasingly justified bipartisan anxiety over the bill. Independent of these political realities, however, the immediacy and tenacity of the White House's defense of the Iran deal (which now has its own @TheIranDeal Twitter account, no less), betrays an acute unspoken discomfort by many Democrats with the practical flaws and global security dangers that the deal presents. Haunted by his electorally-motivated premature withdrawal from Iraq in 2011; his refusal in 2013 to confront Syria's Bashar Assad when he used chemical weapons on his own people; his betrayal by Russia's Vladimir Putin to whom he had offered a reset button, and his impotence in failing to respond to the aggressive expansionist moves of Russia, ISIS, Iran and China, the President and Democrat Party, in signing the Iran deal, seem to be trying to absolve the United States of its role at the forefront of the global fight against Islamic radicalism and other threats. Citing the failed EU-led negotiations with Iran in 2005, which resulted in Iran's massive expansion of centrifuge production, defenders of the deal, such as Fareed Zakaria, have painted a bleak and zero-sum counterfactual argument. It is claimed that the result of Congress's opposition will be an international community that forges ahead on renewed trade relations with Iran, while leaving the United States outside the prevailing global reconciliation and supposed love-in with the Islamic Republic. There are several serious problems with this defense, and similarly with the White House's blitzkrieg public relations campaign to fend off detractors of the Iran deal, with Secretary of State John Kerry commanding the preemptive, and often totally inaccurate, strikes against Congress. In consideration of the colossal failure represented by the North Korea nuclear precedent, let us consider the issues unique to Iran. Foremost, opponents of the Iran deal are not universally suggesting the Iran deal be killed outright or immediately resort to "war." This is simply disingenuous. Instead, the opponents' fundamental premise is that a better deal was left on the table, and thus remains available. The very fact that the Iranian regime was at the negotiating table was indeed a sign of Iran's weakness; any timelines for the P5+1 to "close" the deal were artificial constraints that surely erased further achievable concessions. Second, much ink has already been spilled about the technical weaknesses of the Iran deal. Namely: that Iran's vast nuclear infrastructure remains in place; that the most important restrictions expire in 10 years (a mere blip for humanity); that Iran's uncivilized domestic and regional behavior was a naughty unmentionable; and finally, that the deal undoubtedly initiated a regional nuclear arms race while supercharging the Iranian regime's finances. Third, the gravest consequence of Obama's Iran deal, and the most damning of its continued defense, is that the world bestowed ideological legitimacy on the Islamic Republic's radical theocracy, and in so doing has consigned the people of Iran to near permanent rule under the iron fist of Twelver Shi'a Islamism. This capitulation occurred precisely at a time when the West and the broader Middle East are facing off against the Islamic State -- a terrorist force which, when stripped of its social media allure, is ultimately a Sunni-branded spin-off of the extremist Shi'a Islamism that has ruled in Iran since 1979. The Iranians may be convenient allies as enemies of our enemies today, but not for one second have Iran's rulers suggested their ultimate intent is anything other than the all too familiar "Death to America" and "Death to Israel" propaganda seen for the past 36 years. In what is objectively and wholly a strange deadly obsession, the Supreme Leader of Iran, Ayatollah Khamenei, has been rousing crowds with calls for the destruction of two nation-states both during and after nuclear negotiations. In spite of this public malice, defenders of the deal suggest that "the [Obama] administration is making a calculated bet that Iran will be constrained by international pressure." Why exactly then is Khamenei making clear the opposite? President Obama's willingness to concede Iran's new-found normalized membership in the community of nations on the basis of this nuclear deal is an affront to the liberal, free, democratic principles that have stood against the forces of tyranny throughout American history. It is also an affront the American political system and to the members of both parties who are now being cornered by the President into supporting, or not supporting, such an intrinsically dangerous and needlessly flawed bargain with an avowed enemy. Even more concerning is that the Iran deal may directly conflict with U.S. obligations as a signatory of the Non-Proliferation Treaty (NPT). As a number of critics have pointed out, the Iran deal may be unconstitutional, violate international law and feature commitments that President Obama could not otherwise lawfully make. By seeking approval of the deal under the UN Security Council, President Obama has bound the United States under international law without Senate consent. If the United States is to remain the vanguard of human liberty, President Obama must distinguish between the vain pursuit of his legacy, and the civilized world's deepest need at this consequential hour for the American President to defend comprehensively the fundamental principles that underpin the modern order. Unless his desired legacy is actually to destroy it. As opponents of the Iran deal have noted, there is still time for a better deal that can be had. To start, a total reversal of the Iranian regime's behavior should have been, and still can be, a precondition for the removal of any sanctions related to Iran's nuclear program. Congress can lobby for this change, and should maintain American sanctions and applicable provisions in the U.S. Treasury Department's SWIFT terrorist tracking finance program. Next, while Iran's regional malignancy may run deep in the regime's veins (through the many twisted arms of Tehran's Islamic Revolutionary Guards Corps), an end to Iran's financial and materiel support for terrorist forces such as Hezbollah and Hamas must be demanded, along with the return of the four American hostages Iran is holding. Third, those who argue that Iran's human rights record was not "on the table" in Geneva have needlessly abdicated the West's moral and intellectual high ground to the forces of barbarism and hate that are now waging war across the region. Respect for international humanitarian norms should never be discarded in such negotiations. At the end of the day, the deeper questions for Obama and the entire P5+1 are this: By whose standards were negotiations conducted? And whose worldview will rule the 21st century? In defense of Obama's approach, the deal's supporters point out that the Iranians are a "proud, nationalistic people," which is undoubtedly true, but irrelevant, just as it was for the leadership of Germany's Third Reich. The Iranian regime, by virtue of its radical religious nature, weak economy and political experiment with theocracy, should have borne the burden of coming to the negotiating table with the most to lose. Instead, President Obama, on behalf of the free world, is allowing this pariah state to guarantee its place among the nations, lavishly rewarded for having violated the Non-Proliferation Treaty, and in all its about-to-be-well-funded lethality.